Tiger Mix Feather Extension Kit: A gorgeous blend of orange, natural grizzly, orange grizzly, ghost barred and golden badger rooster feathers. 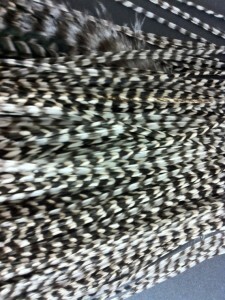 These are salon quality feathers which can be treated like your normal hair. 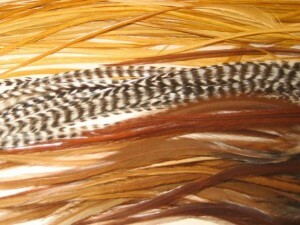 Perfect for long length hair, these feathers range between 7-12 inches long and come LOOSE. 2 silicone beads. Choose between blonde, light brown, or dark brown. If you do not specify a bead color at checkout I will just send a random color. 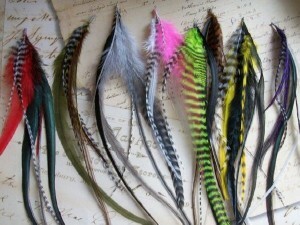 You may request to have the feathers bonded together with a dark glue, but you MUST send me a note upon checkout otherwise I will send them LOOSE. A short piece of fishing line is included to thread the bead onto your hair. All you need is a regular pair of pliers to clamp the link closed!